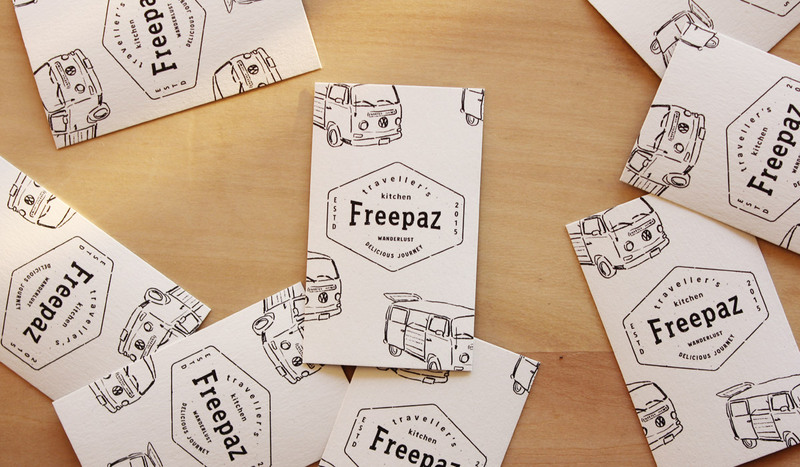 Daisuke Hiratsuka designed these business cards for Freepaz, a mobile catering business that sells falafel sandwiches. “For the design concept, I got the inspirations from their vintage wagon because the wagon is so cute and cool,” Daisuke said. Daisuke created the logo for the brand and drew the catering wagon illustration on the card. On the other side of the card, it’s all about Freepaz contact details and business descriptions on a dark blue background – a perfect contrast with the white texts. Also, it’s great to break through the norm and go with a vertical-oriented design instead. These business cards were offset-printed due to the client’s request to lower down the cost while maintaining a crisp, professional look from the print. Daisuke chose a paper material with good handmade texture for a welcoming impression. Overall, the visual identity offers a cool, friendly image.